We personalize our software to meet your needs. Developed and designed in-house to maximize cohesiveness between all modules. All features continue to evolve based on our client’s input and feedback. The basic capabilities included in every instance of the EMR. 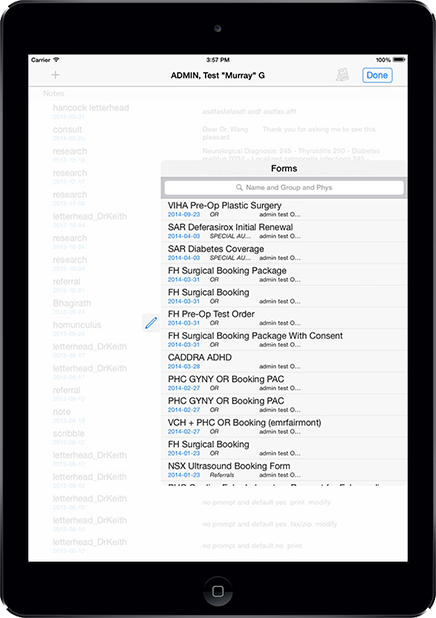 Centralized repository of forms and hardware selections to integrate with your EMR. All you need for a complete paperless chart for patients. Electronic results (eg. from Excelleris) downloaded automatically into the patient’s chart with customizable physician-alerting capabilities. Customizable templates to save time on creating letters, referrals, requisitions, prescriptions and much more. Comprehensive scheduling abilities to meet all your booking needs. Reduce time and maximize profits with our integrated billing solution. 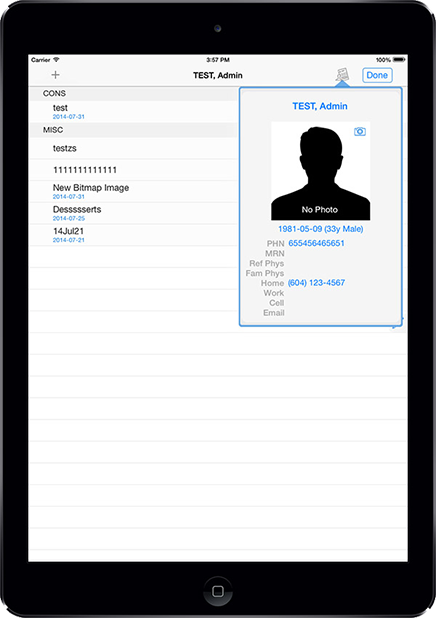 Full incoming and outgoing eFax capabilities completely integrated into the EMR. Provide surgeons with accurate up-to-date statistics and information regarding their surgical waitlist. Order tests from Plexia’s form and requisition library. Create customizable template forms to preset frequently requested tests. These extra features increase functionality to your workflow, and can be chosen or customized to your needs. Confirm patient appointments via sms, email or voice phone call automatically. Patient responses captured into our Scheduler. Patients can scan their healthcare card at the front desk to confirm their arrival. Patients can register their info and fill out forms online before their office visit. 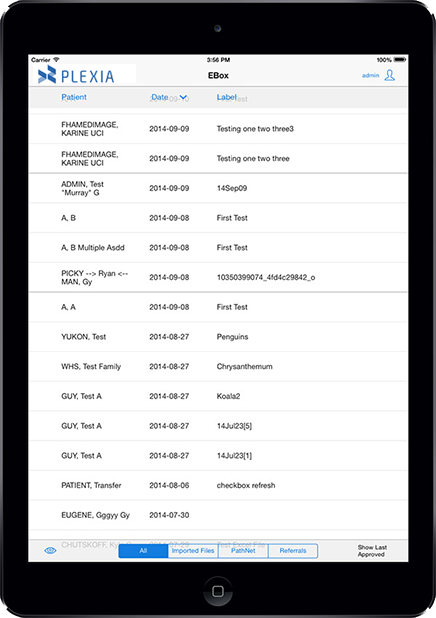 Pharmanet look-up built into the EMR for convenient access to patient’s medication history. Patient chart details can be copied electronically to other Plexia EMRs (instead of using fax) for improved speed, accuracy and convenience. Tailor-designed templates with the ability to show & hide further questions based on answers to prior questions. These answers will quickly generate letters which also eliminate transcription costs. Sync and view a read-only version of your scheduler on your mobile device. Catered to specialists for their unique practice. Receive reports from heart equipment (eg. Holter systems, Stress Tests Machines, ECGs) for a seamless transfer of data into the patient’s chart. Plexia has a unique sophisticated BC Antenatal Record function to help store, track and calculate values based on previous lab results or LMP. Plexia can receive values and results from ophthalmology diagnostic systems to perform further data analysis and reporting. The Homunculus function can track joint information (e.g. tender, tender + swollen, damaged) for further calculations. Many other specialties are also supported. All data stored in Plexia can be charted, graphed and exported for further research, review or comparative purposes. There are a combination of tools within Plexia to help aid information gathering and processing. Feel free to contact us further regarding your research needs. Plexia EMR Version 4 meets Infoway's standards in privacy, security and interoperability. For increased accessibility and mobility. The iPad mobile digital device is a trademark of Apple Inc., registered in the U.S. and other countries. Copyright © 2019 Plexia Electronic Medical Systems Incorporated.All rights reserved.